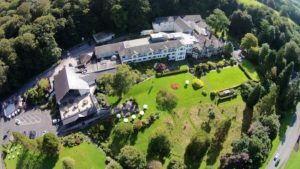 The 2019 All and Everything Conference is to be held at the Castle Green Hotel in Kendal, on the edge of the English Lake District. Kendal is sometimes known as “the gateway to the Lakes,” and boasts of some of the most beautiful countryside in England. The Castle Green Hotel has well-maintained and attractive grounds, and commands spectacular views. Our conference room has plenty of natural light, with a private adjoining foyer where you can sit and relax, or discuss burning questions. The conference room also opens out on to a large balcony, again private to our conference, with tables and seating. From the balcony you have a view over the town, the ruins of one of the castles of Kendal, Scout Scar heathland beyond the town, and (atmospheric conditions permitting) a dramatic view of the Lakeland fells to the west. 24 hour delegates have accommodation with breakfast and all evening meals included in their package, except for the Friday evening meal, which leaves an opportunity to go down town for the evening meal, and will be convenient for the Friday evening concert at Kendal Parish Church. 24 hour delegates and day delegates have a two Course buffet lunch served in the restaurant on the Thursday, Friday and Saturday, and mid-morning and mid-afternoon refreshments (unlimited tea, coffee, soft drinks, biscuits, afternoon pastries, fruit and Kendal Mint Cake). If day delegates wish to have an evening meal (including the banquet on Saturday evening) in the hotel restaurant, then ideally at least 7 days notice should be given. N.B. If day delegates wish to attend the Saturday evening banquet, they should book this separately with the hotel (at £32). Likewise, please can day delegates notify the hotel if you wish to have an evening meal on the Wednesday or Thursday evening (£24 each).